Many people often mix rain barrel with water barrel. Although at the first split second you hear it, it may sound the same, but they are totally different types of barrels. Unfortunately, Google and other internet search engines could be equally deceived, too. That’s why we need to straighten that out. First things first, let’s get the simple fact gathered: rain is one type – among many – of water; while water is not always rain. There are tap water, mineral water, distilled water, sparkling water, well water, and the list goes on. So to consider rain barrel and water barrel the same product is a mistake. Let’s see how these two barrels differ from each other. It is actually easy to define rain barrel. It is a collection system that catches and keeps rain water in a barrel. One can either put the barrel in an open environment to collect rain water that falls into the barrel or take the rain water flow from the roof runoff and direct it to the rain barrel through the waterspout. The latter is the more common practice of rain barrels. You can capture more rain water this way as the water is centralized and straightforwardly directed to the barrel. There is a device needed to connect the rain barrel to the rain water downspout. For this, you can make the rain barrel yourself or buy a pre-made one. Obviously the latter is the more convenient one. Rain barrels are widely used today especially to save water and bills. People use the collected rain water to water their gardens or to flush their toilets. But the happiest party here is the plants in your garden. Watered by rain is simply a lot better than watered by city water. A natural source, rain water doesn’t contain additives like chlorine and fluoride as in city water; and that’s really what your plants need the most. The second one to be content is you, the homeowner, who can proudly reduce your water bill every month. Water barrel, on the other hand, is defined simply as a barrel to contain water. The water barrels here can be of two kinds: food grade water barrel and non-food grade water barrel. The first is dedicated for containing clean, potable water. One will need to ensure that the water barrel they are buying has been made with FDA approved food safe plastic. This is because not all plastics can be used to contain drinkable and edible goods. Non-food grade water drums such as Black color drums,can possibly leach the color dye contained in the plastic barrel into the food or water stored inside. So as long as the reason to keep the water is not to be used for human’s consumption, feel free to use the non-food grade water barrel. 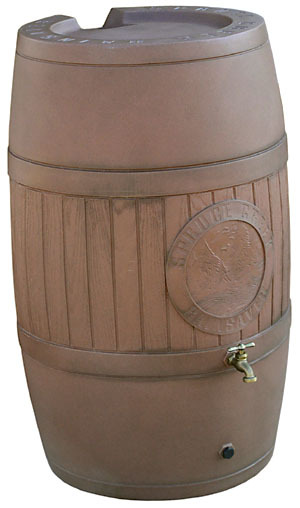 Physically, water barrels usually come in closed top drum with two plastic bung caps as the opening. Sizes vary from 15 gallon, 30 gallon to 55 gallon drums with choices of color of white and blue. Rain water barrel has almost the same appearance, except that it has a connecting pipe to go through the downspout and a faucet to dispense the stored rain water when needed. You may choose blue, brown, white or green for these rain water barrels. Why not checking out our wide collections of both rain barrel and water barrel?